We hope that 2019 has started off well for all our members and that this will be a fruitful year. 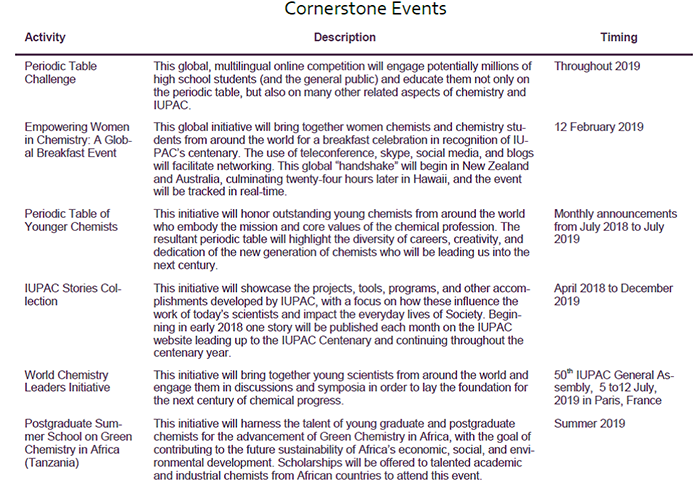 This month we have news of the IUPAC Global Women’s Breakfast and from the KwaZulu-Natal Section, and sadly another two obituaries, that of Professors Peter Cheplogoi and Egid Mubofu, known to many of us. However, we also have good news in that Professor Susan Bourne was one of the awardees of the IUPAC 2019 Distinguished Women in Chemistry or Chemical Engineering. Congratulations Susan! Also, a reminder of the call for the 2019 SACI awards and SACI Fellows. We would like to encourage all SACI members to identify and nominate deserving candidates. The prestigious SACI awards aim to recognise and celebrate the contributions of members and chemist at all levels from the senior Gold Medal of the Institute, through to the SACI Postgraduate and Education medals. The SACI office, run by Laila Smith is located on the 1st Floor of Gate House, room 124. 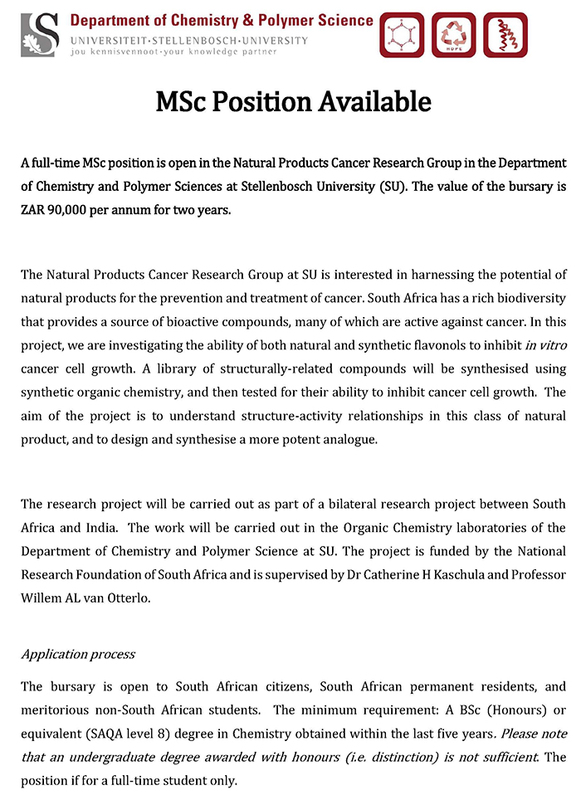 The telephone number is 011 717 6705 and e-mail address is: saci.chem@wits.ac.za. The cell number is 061 282 3477. Office hours are from 8.30 am till 1.00 pm. She can be contacted at any time during her office hours. The newsletter provides a means of getting messages to our membership. Currently the SACI membership stands at over 1000. This newsletter thus provides a means of advertising employment opportunities, conferences and workshops, and even for companies/Universities to promote themselves. We encourage members to use the Newsletter for advertising purposes. All SACI related conferences and events are advertised for free; if not a SACI related event there could be a small charge. For advertising costs contact Laila at the SACI office. 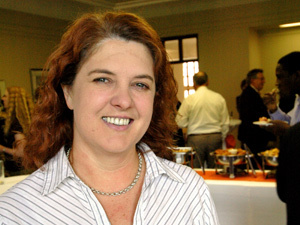 We congratulate Professor Susan Bourne of the University of Cape Town for having been selected as one of the awardees of the IUPAC 2019 Distinguished Women in Chemistry or Chemical Engineering. The purpose of the awards program, initiated as part of the 2100 International Year of Chemistry celebrations, is to acknowledge and promote the work of women in chemistry/chemical engineering worldwide. The award ceremony will take place during the 2019 IUPAC Congress in July 2019 in Paris, France. The awardees are selected based on excellence in basic or applied research, distinguished accomplishments in teaching or education, or demonstrated leadership or managerial excellence in the chemical sciences. In particular, the Awards Committee is interested in nominees with a history of leadership and/or community service during their careers. Well done Susan for putting the face of South African women chemists on the map. We are proud of you! We pass our sincere condolences to the families and friends of Professors Mubofu and Cheplogoi who passed away at the end of 2018. Prof EB Mubofu played a key role in FASC as a member; he initiated the process to get the Tanzanian Chemical Society to host FASC 2017 in Arusha. He was well known to many of us. Egid Beatus Mubofu (PhD) received his B.Sc. (Ed.) from the University of Dar es Salaam (UDSM) in 1992, after which he spent a year working for Unilever (TZ) as a factory management trainee at Kibwele Factory. In 1994, he left Unilever and joined for MSc (Chem.) degree at the University of Dar es Salaam, Chemistry Department under the supervision of Prof. LL Mkayula where he successfully completed in 1996 and graduated in 1997. In October 1997, he joined the University of York (UK) to pursue a PhD in chemistry where he completed his PhD in June 2001 and graduated in May 2002. His research was done at the Centre of Excellence in Green Chemistry, where he researched on novel environmentally benign supported palladium catalysts under the supervision of Prof. James H. Clark and Dr. Duncan Macqurrie. He then went on to become a postdoctoral research fellow for two years (2001-2003) at the University of Groningen, Stratingh Institute under the guidance of Emeritus Prof. Dr. Jan Engberts. In his postdoctoral tenure in the physical organic chemistry group, he worked on the use of water as an alternative cleaner and green solvent for performing Lewis acid catalysed Diels-Alder reactions. He returned to Tanzania in December 2003 and joined the Chemistry Department, University of Dar es Salaam as a lecturer. In 2008 he was promoted to a Senior Lecturer position and since 2012 he was appointed to Head of the Chemistry Department, at the University of Dar es Salaam until 30th June 2016 when he was appointed Acting Director General of the Tanzania Bureau of Standards. In November 2016, he was promoted to the position of Associate Professor of Chemistry at the University of Dar es Salaam. On May 2nd 2017, he was appointed by HE the President of the United Republic of Tanzania to the position of Director General of Tanzania Bureau of Standards (TBS), the position he had been in the acting capacity since 30th June 2016. 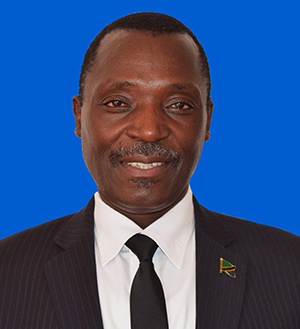 In 2018 Professor Mubofu was appointed Vice Chancellor of University of Dodoma, a public university established in 2007, located in central Tanzania in the country’s capital city, Dodoma. Professor Mubofu’s research interests were on green chemistry, nanomaterials and catalysis. He served as an external examiner on several occasions at the University of Johannesburg and the University of Zululand. He sadly passed away on 18th December 2018. His funeral was held on 24th December 2018. EDUCATION, Science and Technology Minister, Prof Joyce Ndalichako, yesterday led hundreds of mourners, including senior government officials, to pay final respects to Vice-Chancellor of the University of Dodoma (U DOM) Prof Egid Mubofu at Chimwaga Hall. The University's hall was packed to capacity as tearful U DOM students, staff and residents of Dodoma thronged to pay tribute to the late Prof Mubofu who died in Pretoria, South Africa last Tuesday where he was taken for treatment. He was 55. "The nation has lost a diligent public servant who loved his country. He used most of his time to address challenges facing the institution and staff," said Prof Ndalichako. The minister noted that within a short time since he was appointed Vice-Chancellor, Prof Mubofu had improved relations between U DOM and foreign universities and international institutions. "Even when health complications started, he had just arrived from Japan where he held talks with Tokushukai Medical Group on the possibility of providing UDOM with mobile clinics to enable the institution's hospital offer health services to people in remote rural areas," she said. UDOM Chancellor and retired President Benjamin Mkapa, described Prof Mubofu as a very humble person with audacity to make decisions. He said he made the decision to appoint him to the post of UDOM Vice-Chancellor based on his outstanding achievements in the academic arena, a good image in the society and at work, saying when a special team presented to him ten names of scholars for the post, he chose Prof Mubofu. He directed U DOM to print out more copies of Prof Mubofu's last speech, which was delivered on his behalf by Deputy Vice-Chancellor (Academic, Research and Consultation) Prof Peter Msoffe, in order to be distributed to staff. Mr Mkapa explained that Prof Mubofu's last speech, which was delivered on his behalf by Prof Msoffe during this year's graduation after Prof Mubofu's health complications started, demonstrated his vision and expectations towards U DOM. U DOM Academic Staff Association (U DOMASA) representative Cosmas Mahenge, said Prof Mubofu played an instrumental role in uniting the staff and management of U DOM. Survived by a wife and three children, Prof Mubofu will be laid to rest at his home village Tanangozi, in Iringa Region, today. Professor Peter Cheplogoi was an Associate Professor and Chairman of the Chemistry Department at Egerton University in Kenya. He obtained his PhD degree at the University of Natal under the supervision of Professor Dulcie Mulholland. He sadly passed away on 10th November 2018. He is survived by his wife Roselyne and daughters Esther and Sarah. I write from the University of KwaZulu-Natal, South Africa, where Peter has many friends. We registered for our PhDs at the University of Natal in 1999 along with Tracy Pohl and joined Phil Coombes who was already registered for a PhD. At the same time, Chantal Koorbanally, Angela Langlois and Katherine McFarland registered for their MSc degrees and then went on to PhDs. We formed an active Natural Products Research Group under the guidance of Professor Dulcie Mulholland, of which Peter was an active member. He was one of the first Kenyans to join the University of Natal for a PhD in Chemistry. Peter was very well liked. He was a true gentleman and an extremely humble person. We kept each other company while working in the laboratory and enjoyed taking our tea breaks together talking about all sorts of things. Peter often celebrated Christmas and birthdays with us and was part of the family, fitting in very well. We also travelled abroad together and discovered new places. Peter was great company to travel with and very easy going. We finished our PhDs in December of 2001 and graduated in April the following year, Peter Cheplogoi, Phil Coombes, Tracy Pohl and myself along with several Masters and Honours students. I still have that priceless group graduation photo in my office. When Peter finished his PhD he went back to Egerton University, but still kept the relationship going. He rose amongst the ranks to Associate Professor and examined many of my postgraduate student's theses. No matter how busy he was, Peter would never turn down a request from me to examine one of my student's thesis. He also forged relationships with others in the department. In December 2010, he invited Prof Nyamori to give a lecture, which was very well attended, and included the then Dean, Prof. Moses Rotich. He also introduced Prof Nyamori to Dr Joshua Kibet, and the two have formed a very productive collaboration. Through this relationship a Kenyan student will now be enrolled at UKZN, South Africa. Peter will always be remembered for always having a smile on his face, his kind heart, gentle nature and all round goodness. He touched the lives of many in South Africa and will always be remembered. The University of California system announced it will stop paying to subscribe to journals published by Elsevier, the world’s largest scientific publisher. This could have a significant impact. The SACI KZN Section organises the annual Honours/BTech Symposium. The event was kindly organised by Drs. 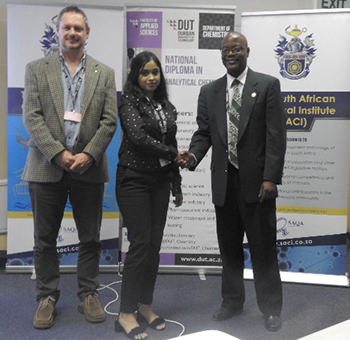 Thabang Mokhothu, Lawrence Madikizela, Thishana Singh and Prof Vincent Bisetty. The 2018 SACI Hons/BTech Symposium was held at the DUT Library Complex on Thursday 25 October 2018 and approximately 100 students turned up for the event from universities across the KZN province, including Durban University of Technology, University of KwaZulu-Natal, University of Zululand and Mangosuthu University of Technology. The event sees academics and students converging in one area to discuss employment, funding, research and developments within the field of chemistry. The symposium caters for postgraduate students doing their Honours and Bachelor of Technology degrees. Students are given an opportunity to present their research to fellow students and academics. Top students that are studying chemistry are selected from each university. Students compete against each other by presenting their work. Delivering the keynote address at the event was Professor Carin Napier, Director Research and Postgraduate Support, who talked on the research done at DUT and encouraged young scientists at the start of their careers to stay motivated and keep up the hard work. Ten students, two from DUT, two from UniZulu, two from MUT, and two each from UKZN Westville and UKZN Pietermaritzburg campuses, presented their BTech/Honours research projects orally while another 10 students presented posters on their projects. The oral and poster presentations were adjudicated and prizes were awarded. There was a total of 2 cash prizes in both the oral and poster categories, each. The winners are listed below together with their respective institution. The prizes are sponsored by the RSC North section, and are kindly acknowledged. 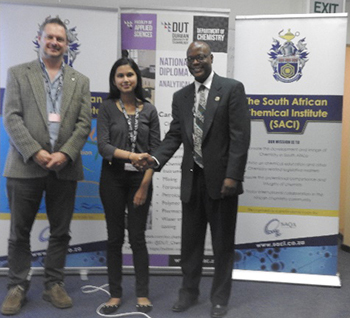 Oral prize winners: Top left: Miss Sonam Singh; top right: Miss Pooja Philip; bottom Mr MA Khan, shaking hands with the SACI president, Prof Vincent Nyamori, and the SACI KZN Chair, Prof Werner van Zyl. 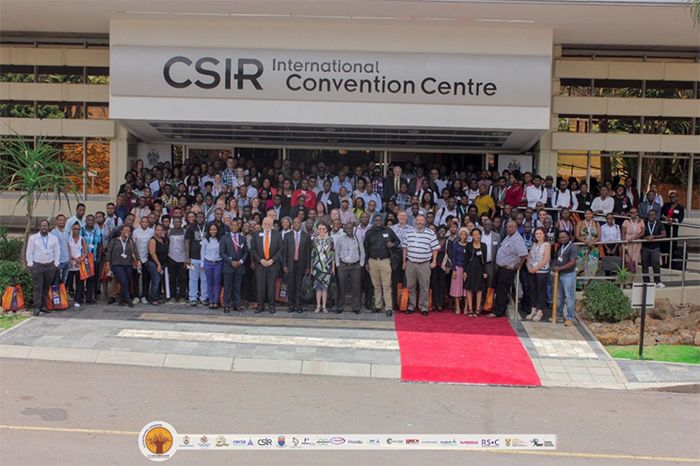 A special note of thanks to the SACI Conference Attendees at CISR – ICC, Pretoria from 2nd to 7th December 2018. The long awaited conference has come and gone, only memories to cherish forever remain. The Organisers of the 43rd SACI National Convention wish to thank each and every one who attended or contributed in one way or another to the success of the conference. We really appreciate the time taken out of your busy December holiday schedule to present, adjudicate, assist and act as Chair of sessions, some at short notice. It was indeed a pleasure working with you all. The conference had a total of 324 delegates over a period of five days, 3rd to 7th December 2018, attracted no less ten nationalities, among them where delegates from Canada, United States, United Kingdom, Germany, Russia, South Africa, Lesotho, Botswana, Zimbabwe, Iswatini, Kenya, Tanzania, Nigeria, Ghana, Democratic Republic of Congo, Uganda, Malawi, and many more. A total of 174 delegates registered as students. Even more pleasing was the fact that women constituted more than 56% of the total delegates. More than 100 talks and 144 poster presentations were delivered. We will be failing in our duty not to appreciate the presence and thought provoking talks by our plenary, keynote, SACI award winners and invited speakers from all fields of chemistry. Special thanks goes to our host institutions; Universities of Venda, Limpopo, Sefako Makgatho and Tshwane University of Technology, Council for Scientific and Industrial Research, Nuclear Energy Corporation of South Africa for their support and contributions, not forgetting City of Tshwane for transportation. In the same vain, we wish to thank all our sponsors; Department of Science and Technology, National Research Foundation, Royal Society of Chemistry, PerkinElmer South Africa, Bruker South Africa, Siemens, Prama, Merck group, NECSA NTP, NECSA NuMeRi, Ingaba Biotech, Separation Scientific, Hidden Analytical and all the exhibitors, for it was through their generous contribution that this conference was a success. We also wish to thank Schrödinger and Chemistry Class Advantage (CAS) – American Chemical Society Division for their contribution through the workshops offered. The medal shall be known as the Gold Medal of the South African Chemical Institute. The medal is gold-plated, and bears the Institute’s name and crest on the obverse, and the name of the medal, together with the name of the recipient and the date on the reverse. The award shall be made to a member of the Institute whose scientific contributions in the field of chemistry or chemical technology are adjudged to be of outstanding merit. The medal shall be accompanied by a monetary award to the value of R10 000, together with a suitably inscribed scroll. The medal shall be known as The Raikes Medal of the South African Chemical Institute. The medal is gold-plated, and bears a likeness of Humphrey Rivaz Raikes with his name on the obverse, and the Institute’s name and crest, and the name of the recipient and the date on the reverse. The award shall be made to a member of the Institute, under the age of 40 on 31 December in the year of the award, whose original chemical research shows outstanding promise, as judged by the person’s publications in reputable journals. It is further stipulated that the research shall have been performed in South Africa. The medal shall be accompanied by a monetary award to the value of R2 500, together with a suitably inscribed scroll. The medal shall be known as the The Chemical Education Medal of the South African Chemical Institute. The medal is struck in silver and bears the Institute’s name and crest on the obverse, and the name of the medal, together with the name of the recipient and the date on the reverse. The award shall be made to a member of the Institute who has made an outstanding contribution to chemical education, as judged by the person’s published work in the previous five years. Published work may be in any form and may be related to any level or educational context. The medal shall be accompanied by a suitably inscribed scroll. The medal shall be known as The Sasol Chemistry Innovator of the Year Medal. The medal is gold-plated, and bears the SASOL logo together with the inscription “Chemistry Innovator of (the year)” on the obverse and the Institute’s name and crest and the name of the recipient on the reverse. The award shall be made to a member of the Institute based in South Africa whose scientific contributions in the field of chemistry or chemical technology during the year preceding the award are adjudged to be outstandingly innovative. The award shall comprise, in addition to the medal, a monetary award of a value determined by the sponsors, together with a suitably inscribed scroll. The recipient of the award shall be known as the “SASOL Chemistry Innovator of the Year”. Past medalists are ineligible for nomination for a second award of any of the above medals. 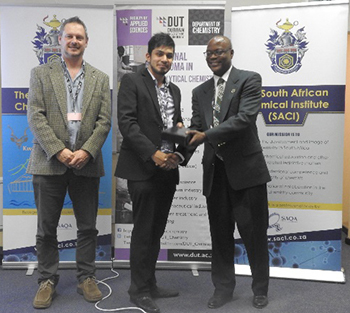 The awards shall be known as the SACI Postgraduate Awards of the South African Chemical Institute. The awards shall be made to student members of the Institute engaged in research towards a MSc or PhD degree and registered in a School/Department of Chemistry at a South African University, or a MTech or DTech degree registered in a School/Department of Chemistry at a South African University of Technology. The number of awards shall not exceed five per annum, and the awards are limited to one per institution. The recipients of the awards shall be known as The SACI Postgraduate Awardees. Past SACI/Sasol Postgraduate Awardees are not eligible for nomination for a second award. The award consists of a monetary award to the value of R2000, together with a suitably inscribed scroll. Has the candidate done something worthy of admiration in the experimental field (e.g. a new, noteworthy, experimental design)? Has the candidate communicated the experimental results in any useful way (in printed form, or at conferences or symposia)? Does the candidate have a broad appreciation of the role and context of chemistry as a science? Does the candidate play a productive role in his/her chemistry department? The persons submitting the nominations shall supply complete curricula vitae of the candidates, detailing all academic achievements. The group of people nominating a candidate must be able to assess the impact the nominee has made in his/her department. Hence, a combined process of peer and supervisor review should inform the selection of the candidate. In addition to the backing of the supervisor, the candidate shall require the support of at least one other member of staff of the Department. The candidate must also enjoy the support of a number of fellow postgraduate research students. All the support for a candidate must be submitted in writing. The endorsements should mention how the candidate reflects the qualities enumerated in the list above. Final endorsement may reside with the Head of Department, where appropriate. The merits of the work of candidates may be brought to the notice of the Council either by persons who desire to recommend candidates (nominations) or by the candidates themselves (applications). Nominations and applications should be received by the Institute not later than 31 May 2019. Applicants must provide a list of publications, and/or non-confidential internal reports and other appropriate information in support of the application, together with curricula vitae detailing all academic and professional achievements. In the case of the Raikes medal three reprints each of those publications considered to represent the candidate’s most significant work must be submitted. In the case of the Chemical Education Award copies of the publications to be considered, together with any explanatory or supporting material, must be submitted. Each nomination or application should include the names of two persons with knowledge of the candidate’s work, to whom reference may be made by the Institute. Further details on these awards and the particular nomination requirements can be found at the Institute’s website: www.saci.co.za. The Council may at its discretion suspend any or all of these awards in any year in which there are no suitable candidates. REMEMBER TO SUBMIT YOUR NOMINATIONS!!! 2. All applicants /nominees are required to submit a short profile. 3 Shortlisted finalists will be required to submit three high-resolution photographs to be used for publicity. Nominations in the Natural (Life and Physical) and Engineering Sciences, and Humanities and Social Sciences fields are requested from established woman scientists or researchers with at least five years of postdoctoral experience, and who are actively involved in research. NB: Overall winners in the past ten years are not eligible to be nominated in the categories in which they won. Nominees will be judged on their research publication record, their international stature (as evidenced by their presentation of keynote addresses or papers at international conferences), their experience in supervising postgraduate students and researchers, the relevance and impact of their research, and exploitability of their research outputs (i.e. the possibility of using the research results to develop or improve products, processes and services). Winner: R80 000; first runner-up: R60 000; and second runner-up: R40 000. First page of each of your 10 best articles, and the title pages of your books or book chapters. List of intellectual property (IP) outputs with relevant registration numbers, or list of outputs with inclusive growth and development impact. Nominations are requested from emerging woman scientists or researchers under the age of 40 or turning 41 during the year of the awards who have doctoral degrees, and whose research projects have contributed to advancing science and building the knowledge base. In the context of being early career scientists, nominees will be judged on their research publication record, their national and/or international stature (as evidenced by their presentation of keynote addresses or papers at international conferences), their experience in supporting younger students, the relevance and impact of their research, and/or the potential exploitability of their research outputs (i.e. the possibility of using research results to develop or improve products, processes and services). Winner: R70 000; first runner-up: R50 000; and second runner-up: R30 000. Nominations are requested from established woman scientists or researchers with at least five years of postdoctoral experience, whose innovation (emanating from research) advances South Africa’s competitiveness in the 4IR. Nominations are requested from emerging woman scientists or researchers, under the age of 40 or turning 41 during the year of the awards, who have doctoral degrees; whose innovation (emanating from research) advances South Africa’s competitiveness in the 4IR. For both the distinguished and distinguished young researchers, nominees will be judged on their research publication record, innovation outputs (use of the research results to develop or improve products, processes and services) in advancing South Africa’s competitiveness in the 4IR. List of intellectual property (IP) outputs with relevant registration numbers, or list of outputs with inclusive growth and development impact of innovations. These awards will be made to twelve women who are currently involved in full-time study or research leading to master’s or doctoral degrees. 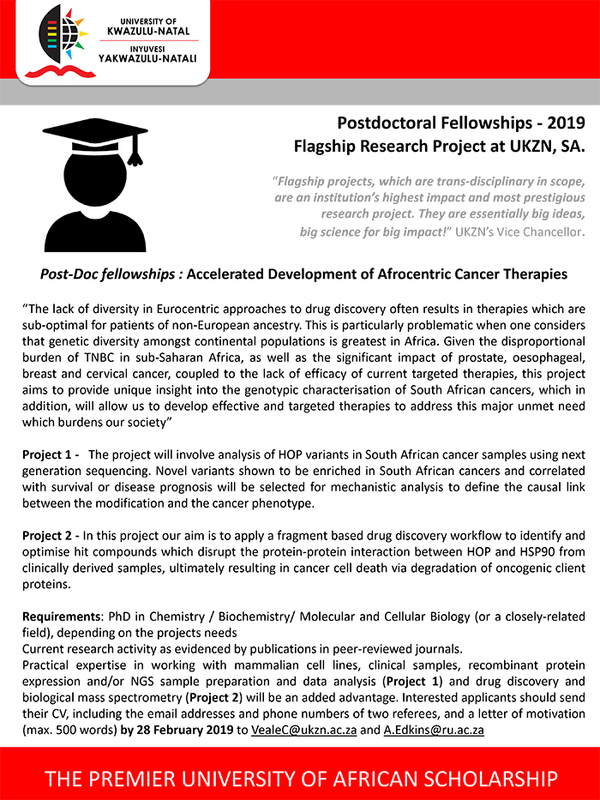 The fellowships recognise outstanding ability and potential in research, enhance the women’s research experience and output, and encourage more young women to complete research degrees. Six doctoral students: 2 in Natural Sciences, 1 in Engineering Sciences; 1 in HSS, 1 in IKS, and 1 in Astronomy. high performers in their current and previous degrees. NB: Previous fellowship/scholarship awardees cannot apply/ be nominated for the same degree of study. Applicants will be judged on the quality and performance in their studies; past and present achievements; quality and feasibility of proposed study/research plan and time schedule; relevance of their research (potential to provide solutions to immediate problems and scarcity of researchers in the field pursued); and their career plans as per the application criteria given. any other indicators of outstanding ability. a demonstrable need for the specialised knowledge and skills that she plans to acquire. Scholarships will be awarded to young women who have registered for degrees in scarce skills areas such as Agriculture, Architecture, Astronomy, Astrophysics, Computer/Information Sciences, Engineering, Mathematics, Statistics, or Physics. Quality and feasibility of the proposed plan of study or research, and proposed time schedule. Academic and professional qualifications, including research publication record. Candidate's commitment to the advancement of women and girls in South Africa/Africa as demonstrated by her previous work and her proposed study or research. The award can be used for normal academic registration and tuition fees, and also to expand the experience of the successful candidate. It can also be used to purchase additional equipment required for the completion of the master's or doctoral degree, or to enable the recipients to spend three to six months at an international research facility to improve the outcome of their studies. the candidate's desire to be considered for the scholarship. the exploitability of research outputs (i.e. the possibility of using research results to develop or improve products, processes and services). Our website can be used to advertise events from across the world – not just those organised by the Royal Society of Chemistry, www.rsc.org/events/africa. Please share this information across your networks, and through your societies. We welcome all to the PACN and we want to share our opportunities for training, funding and events with a wide community across Africa and globally. Help us to reach those who could benefit from our work. 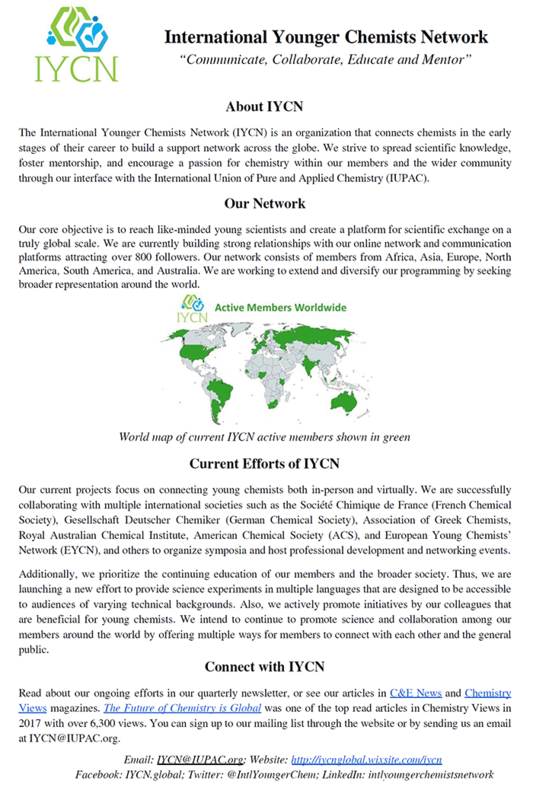 The Pan Africa Chemistry Network exists to support African science; events, training, access to resources and a strong community; full details are here: www.rsc.org/pacn. c. On twitter, please look up @hvdriver or #PanAfricaChem to find out more. All our events in Africa are listed here: http://www.rsc.org/membership-and-community/connect-with-others/geographically/pacn/events/ including conferences and our programme of GCMS and LCMS training across the continent. Special Annual Theme Award: The NSTF’s theme for 2019 is the'International Year of the Periodic Table of Chemical Elements’ (#IYPT2019), as declared by the United Nations (UN). Aligned with this, the Special Annual Theme Award for 2018/2019 will be made for an outstanding contribution to materials for inclusive economic development. It is possible to register for each day separately or to register for both days – register by no later than 14 March. This is the third event held in partnership with the South African National Convention Bureau (SANCB) of SA Tourism. The SANCB support services are promoting the hosting of international conferences locally.This is a free event for all employees of NSTF member organisations. For more information about this event, read the invitation. 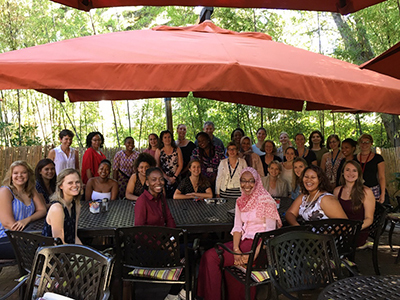 The Global Women’s Breakfast was designed to assist women chemists to expand their network of contacts, both locally and internationally. The first breakfasts began in New Zealand at approximately 07:00 local time, initiating a global hand wave around the world ending in Hawaii. In South Africa breakfasts were organised in Stellenbosch, Durban and Johannesburg. About 40 women (and one man) gathered at the Stellenbosch Botanical Gardens for an informal breakfast on 12 February 2019 from 08h30 to 10h30. There was participation from the University of Cape Town, University of Stellenbosch and Cape Peninsula University of Technology. Margaret Blackie (University of Stellenbosch) opened the event by outlining the purpose of gathering to celebrate the contributions and achievements of women in Chemistry. She explained that this global event was intended to celebrate the centennial of IUPAC as well as the 2019 International Year of the Periodic Table. We joined some 200 breakfasts taking place around the world, starting in New Zealand and moving west with the time zones. The event was broadcast on twitter using #IUPAC100 and #GlobalBreakfast (with this event's handle being @RSC-za). Susan Bourne, Cesarina Edmonds-Smith (both University of Cape Town) and Seanette Wilson (Biovac Institute) had been invited to form a panel for discussion, selected because each is at a different career stage and each had followed different career paths. PhD students Bella Claassens (Stellenbosch) and Junia Malapile (CPUT) led the way in posing questions to members of the panel, and facilitated discussion with the audience. Topics covered included leadership, managing work/life balance, raising children while building a career, finding your strengths and a number of others. Shortly before 10h30, a video link was established with our counterparts in Leipzig, Germany, who were beginning their breakfast as ours ended. Thanks to the RSC (Southern Section) and SACI for support, and to Margaret Blackie, Nikoletta Bathori, Bella Claassens and Junia Malapile for organising and running an outstanding networking event. Wits University’s participation comprised an informal breakfast at the School of Chemistry from 08h30-‐10h30. Women from across the different institutions were invited to participate. The event was opened by early-‐career chemist Monika Nowakowska (Wits), followed by a brief introduction to the event. The two invited speakers shared their experience and insight during the breakfast: Prof Colleen Vogel from the Global Change Institute, and Dr. Finney from Impala Platinum. 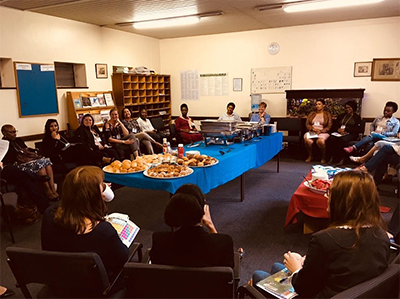 The informal breakfast was a ‘facilitated conversation’ following the guidelines set out by IUPAC; conversation was facilitated by early career chemist Sadhna Mathura (Wits). The event closed with the vote of thanks by Nowakowska. 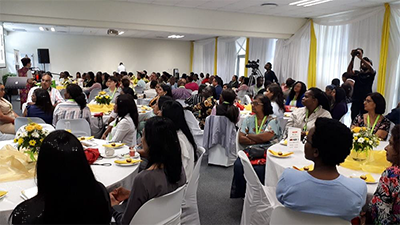 The breakfast in Durban was held on the Westville Campus of the University of KwaZulu-Natal. It was attended by about 100 women and a handful of men. The event was opened by Professor Songca, UKZN DVC: Teaching and Learning, himself a chemist. Professor Bice Martincigh then gave a brief introduction to IUPAC and the purpose of the event. The main speakers were Dr Ntsapokazi Deppa from Umgeni Water and Dr Tracy Wessels from SAPPI Saiccor. They gave delightful and entertaining glimpses of life as a female chemist in industry. Professor Chats Devroop and Jamie-Lee Simmons entertained the guests with music and song. All the sponsors and Dr Brenda Moodley and her team are thanked for making this event possible. Nominations Open for Periodic Table of Younger Chemists! 2019 has been declared as the International Year of the Periodic Table. 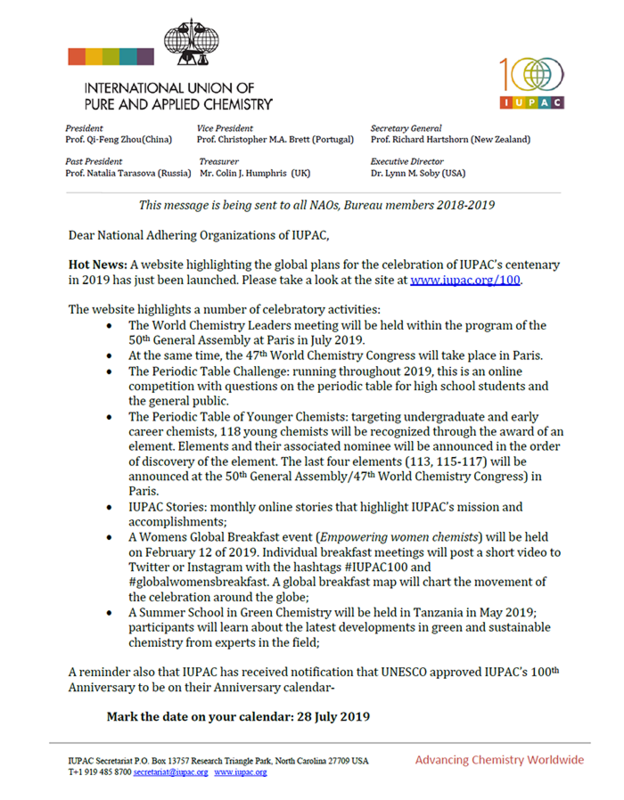 This is also the time when IUPAC is turning 100! 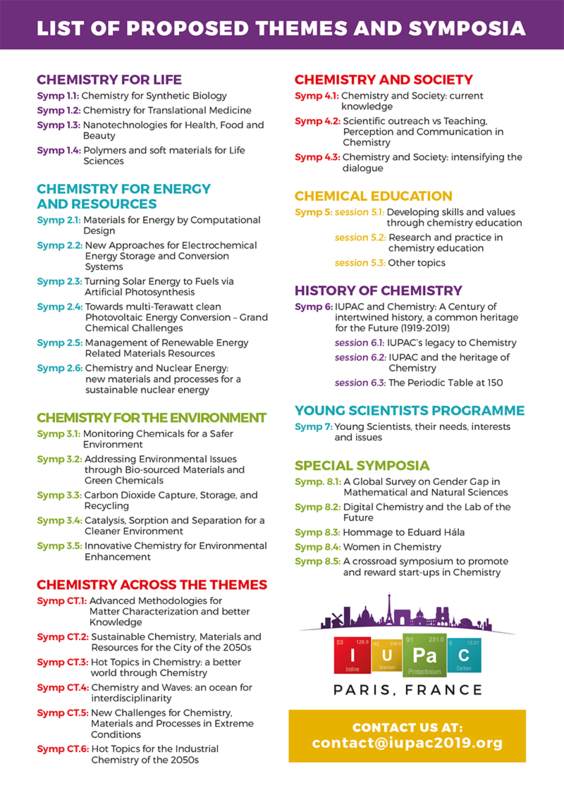 As part of the celebration of IUPAC100, IUPAC and the International Younger Chemists Network (IYCN) announces the creation of a ‘Periodic Table of Younger Chemists’. Beginning in July 2018 and ending in July 2019 at the World Chemistry Congress and IUPAC General Assembly, we will honor a diverse group of 118 outstanding younger chemists from around the world who embody the mission and core values of IUPAC . The resulting periodic table will highlight the diversity of careers, creativity, and dedication of the young chemists leading us into the next century. See details here: http://iupac.org/100/pt-of-chemist/ . Winners will be profiled on the IUPAC100 website and will receive a certificate from IUPAC. Elements of the Periodic Table of Younger Chemists will be revealed over time in order of scientific discovery ( see Wikipedia ). Approximately eight elements will be revealed each month beginning in July 2018 with the final elements being awarded at the IUPAC General Assembly and World Chemistry Congress in Paris , France in July, 2019. * Nominate a Younger Chemist! * Check out IUPAC 100 Activities! Video by 2017 IUPAC-Solvay Award Winner and IUPAC100 Member, Dr. Scarabelli. See more videos on IUPAC YouTube Channel! For further details, see the IUPAC webpage. 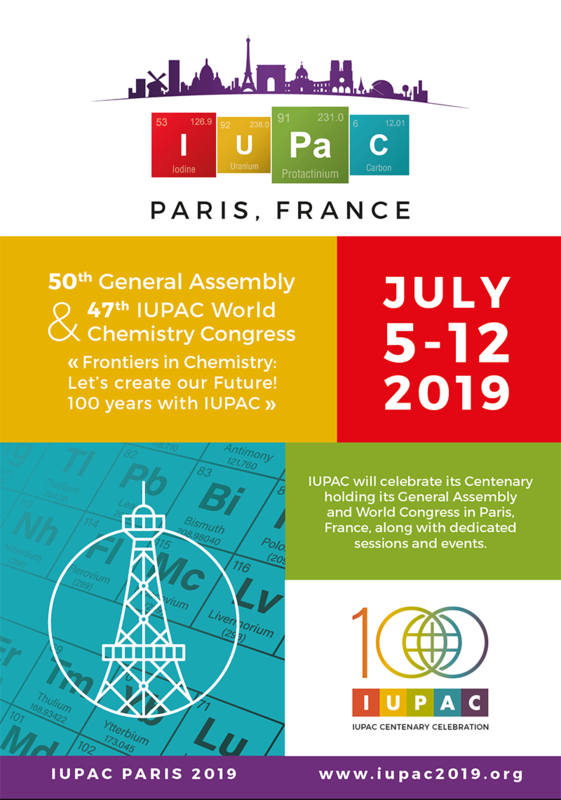 2019 is the centenary of IUPAC. A number of celebrations and events are planned. 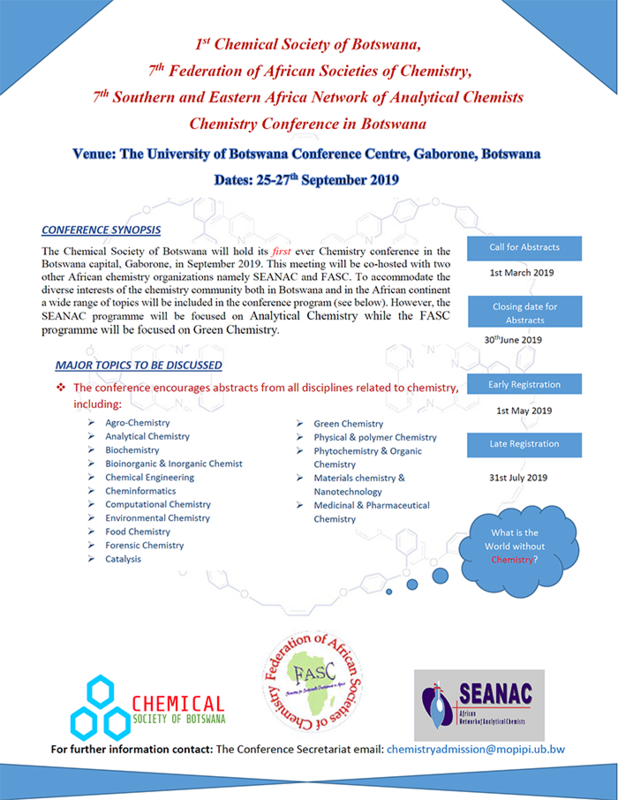 A three day SEANAC conference will take place in Gaberone, Botswana from September 25-27, 2019. The last day will be dedicated to FASC activities. The conference will possibly be hosted by the University of Botswana in their brand new conference centre that has auditorium from plenary lectures and rooms for parallel sessions if needed. or e-mail: caia@iafrica.com for pdf files of news and information. The South Journal of Chemistry has turned 100 years old and we are pleased to note that the impact factor of the Journal is now 1!. We encourage all SACI members to submit manuscripts to the Journal. Journal submission details can be found at http://saci.co.za/journal. Details of the journal and the editors can be seen at http://www.journals.co.za/sajchem/. This Journal is published electronically. The webpage is: http://www.saci.co.za/. The South African Journal of Chemistry, published by the South African Chemical Institute, has been publishing high quality papers, in all fields of Chemistry for 100 years. The Journal went fully electronic in 2000 and is freely available through open access online (http://reference.sabinet.co.za/sa_epublication/chem). It is a CAS-abstracted publication and is listed in Current Web Contents. It is also part of the Scielo group. It has retained its status as an accredited publication with the South African Department of Higher Education and Training. We encourage South African chemists to publish in the journal especially in this centenary year! Papers on any aspect of Chemistry Education such as teaching organic, analytical, physical, inorganic, polymer, green, climate change/environmental chemistry, ICT in chemistry and chemistry curricula as well as assessment in chemistry are acceptable for publication. We also encourage issues on chemistry and indigenous knowledge/practice, chemical safety, natural products and related areas. A fully open access journal in 2016, all authors can publish their papers on an open access basis in the South African Journal of Chemical Engineering at the reduced rate of $400 (USD). Mendeleev 150: Ten months from now! Call for papers announced today! The ideas and concepts behind Nano science and Nanotechnology started as early as 1959. Currently the use of nanoparticles as building blocks, like LEGO bricks, and their assembly into larger structures represents a rapidly growing branch of research. Anton Paar supports you in breaking into new horizons in this field by providing the world’s broadest particle characterization portfolio. This interactive seminar will help you to better know your particles and the available measuring technologies used to predict your materials behavior. Once you RSVP we will send you a programme, please feel free to attend the sessions on days of interest to you. 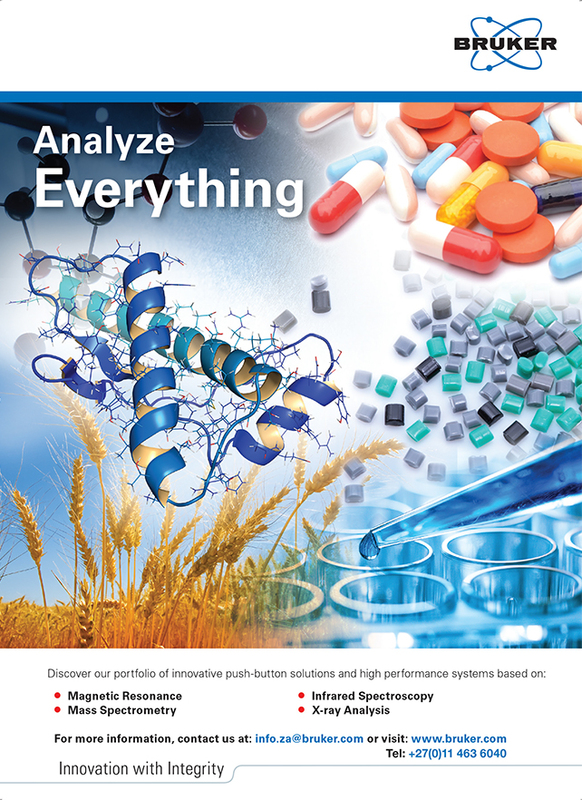 Are you identifying unknown chemical substances or characterizing molecular structures? The Cora Raman spectrometers from Anton Paar are ideal for a quick, precise, and non-destructive chemical identification of solids, powders, liquids, gels, organic, inorganic, and biological materials and pure chemicals. The Cora 100 handheld Raman analyzer is the right choice for on-the-spot identification or confirmation of substances such as hazardous materials, narcotics, explosives, and chemical warfare agents in the field or for verification measurements on incoming goods. It helps firefighters and rescue teams to assess potentially dangerous substances, provides on-the-spot identification of narcotics, listed substances, or explosives for police, customs, security forces, and the military, and verifies substances in incoming goods inspections. The Cora 5X00 Raman spectrometers are compact benchtop instruments which are also transportable. They are highly versatile with their multi-wavelength option, many accessories, and the option of battery operation in vehicles. The Cora 7X00 series is designed for industrial and academic research applications. It provides spectra with high resolution and low noise despite a space-saving instrument size. This enables the measurement of samples with low Raman-scattering properties or low concentrations. Are you interested in seeing the new Cora 100 handheld Raman spectrometer in action?